6,843 ft. Mount Sanitas is a modest bump compared to Boulder’s iconic Flatirons, yet it is one of the city’s most beloved destinations. Located about a mile from downtown Boulder, the easy access, fantastic views and challenging trails make it the perfect place for a lunchtime run or a moonlight hike. The classic loop of Mount Sanitas Trail to ascend, East Ridge trail to descend and the Sanitas Valley Trail to cool down is only 3.1 miles but can take even strong runners over an hour to complete. Simply making the full loop without stopping gives you huge bragging rights. Even the less burly Sanitas Valley - Dakota Ridge Loop ( at 2.4 miles round trip) is still a worthy run -- remember, all of this happens over 5,000 feet above sea level. Even though the summit trails have some steep steps and roots to navigate, the rugged trail is still run-worthy so if you are up to the challenge give it a go. And don’t worry, if you need to stop and take a breather, the views to the east are spectacular -- on a clear day, you’ll easily see the skyscrapers of Denver. To the north is the towering summit block of Longs Peak and every once in a while a clear view south lets you see Pikes Peak in Colorado Springs. 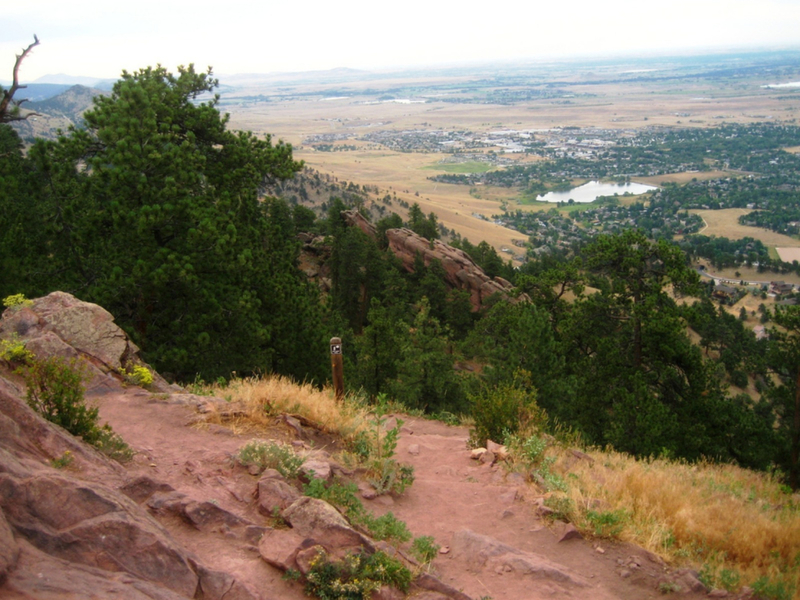 For trail runners, Mount Sanitas is the perfect playground to develop your strength and endurance. While the trails aren’t long, they make up for it with gritty elevation gain -- the standard Mount Sanitas trail has 1,320 ft. of elevation in 1.8 miles. Not ready for the big hill? Work up to it by running the 1.3 mile Sanitas Valley trail, a wide but beautiful dirt path that manages to quietly gain 600 vertical feet before heading up the 0.4 mile East Ridge trail to the summit. Sanitas has a lot of variety and loop options for a relatively small mountain. At the foot of the mountain, the Valley Trail is paralleled by the Dakota Ridge trail, a 1.0 mile path that offers some shade compared to the exposed valley trail. There are two trails to the summit that are often done in a loop, and either direction will give you a heck of a workout. The Mount Sanitas trail (out of the Mapleton Trailhead) cuts to the chase, instantly going vertical with a series of steps that quickly gain altitude. The East Ridge trail, in contrast, starts at the northern terminus of the Sanitas Valley Trail and begins with more modest (but still steep) switchbacks before reverting to the similar style big steps found on the Mount Sanitas Trail. 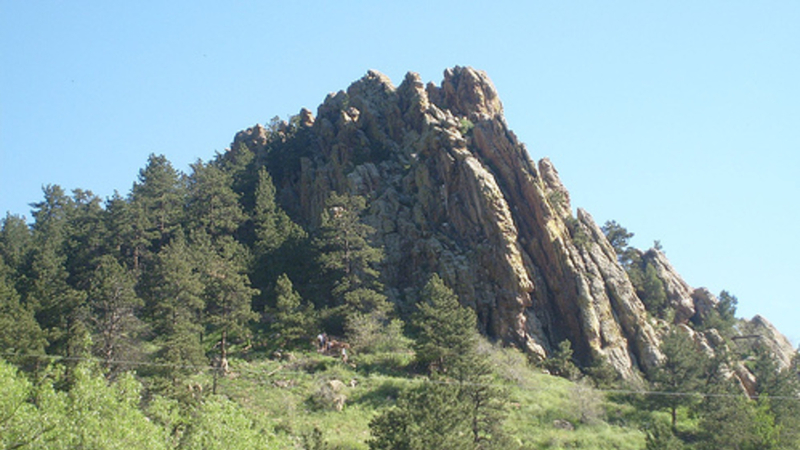 Of course, Mount Sanitas is a great hike but for runners, it really is a classic test piece. Many runners work their way up to a full jog of the summit trails by “hiking the steps and running the flats”, a proven strategy for reaching the top in record time (or at least personal record time). Dogs are welcome on-leash or off-leash with a green tag from the city of Boulder’s dog license program. Hill runners will love the interval-style terrain on the summit trails -- steep steps complemented by short, flat recovery sections. Jogging up the peak can take 35 minutes or so, but in that time the 1,300 ft. elevation gain will provide an excellent workout. Those looking for a challenging trail run without the ridiculous elevation gain will love the Valley Trail, where deer, coyote, fox and the occasional black bear can be seen on the hillside. Perhaps most of all, those hoping to progressively build their running skills will enjoying using Mount Sanitas as a benchmark of their fitness as they work their way up to the fabled summit run. Centennial Park trailhead is 0.3 miles west of the intersection of Mapleton Avenue and 4th Street along Mapleton Avenue (which turns into Sunshine Canyon). The large trailhead is well marked on the south side of the road and accommodates 25 vehicles. To access the west side of Mount Sanitas, follow the trail from the lot and cross the paved road to the trailhead picnic shelter, where the Mount Sanitas and Sanitas Valley Trails begin.